A CryENGINE game that can be played through Facebook. There. That’s pretty much all you need to know about Project: Theralon. I’d not heard much about Theralon before Gamescom, other than that it was a prototype sandbox MMO from Infernum, the team behind Brick Force. Now, when someone says “sandbox” to a player of MMORPGs, we immediately get a little excited. First, you have to understand the difference between the sandbox and regular MMO. For the latter, there is a linear progression of quests through a storyline; your character will level up, hit that level cap and play out the rest of his or her days playing through the same daily content. 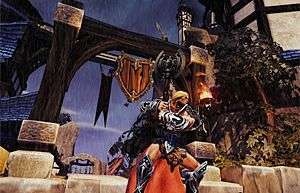 In a sandbox MMO, the game world and the character become a second life, much like the popular MMO Second Life; a character becomes a member of a living world with unpredictable events going on in it. Take EVE for example – your character might die, meaning you lose everything you have, or he might become a pirate or a corporate executive. It’s all about being free to do whatever you want. So when Infernum explained that they were working on the prototype of a new Sandbox MMO, I was very interested to see what they had to bring to the table. It turns out they are bringing a lot of very interesting ideas, the first of which is flying a dragon. Don’t get me wrong, this is no dragon mount, but your own personal dragon that you will have a backstory and relationship with, hopefully with the option to customise. The player will become a dragon rider and have access to their own dragon, which is fully controllable in third person right from the start. As your main method of travel is dragon airways, much of the game world is huge, with open spaces and incredible panoramic vistas. We were shown a few concept art shots early in the presentation and the environments go from the classic open mountain-tops to huge underground caverns. 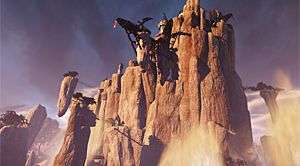 At the minute there aren’t many details on the game’s combat systems; the player can jump off their dragon and into combat, and there may even be some air combat in the future. There is also no class system, as Infernum have decided to go along the skill-based leveling system for their skills and abilities - if you use magic a lot, your magic levels will increase and you will gain access to better abilities. The player will have access to everything from melee and ranged weapons to a number of spells straight from the get go. The developers also explained that there will be companion characters, but not in the style of games like Star Wars: The Old Republic; these characters can work as a secondary character, allowing the player to do change what they are doing on the fly. For example, the player’s companion might be a soldier who has been tasked to guard the player city (I’ll get to that in a second), when suddenly the place comes under attack from Orcs. Rather than fly back as the dragon rider, the player can switch to their soldier character and battle back the Orcs. Alternately, the AI will take over that companion character and try to hold off the Orcs until you arrive. Your companion character could be any number of other things from the town guard, to a farmer or maybe even a merchant. Where the game really stands out is around the idea of player cities. It seems that in Theralon players can set up their cities anywhere in the game’s world – if you find a nice looking mountain top, your guild can begin construction of your fortress town. The town building will use an interesting creation tool as many of the structures will have a core piece, for example a town house. The player can then add or remove additional pieces which give the house a unique feel. This tool will be applied across every building, from houses to defense towers. It’s unclear at the minute what the purpose of the player cities will be, but the developers are looking at ways of allowing other players to attack cities and this may lead to wars between guilds in the future. However, not all of this is confirmed, as the developers reminded us numerous times that ideas were still being thrown around. When asked about which platforms they see the game being played on they decided to show us something we had not seen before. An MMORPG using the CryENGINE, of Crysis fame, being played in real time through a Facebook plug-in. The game looked a little scaled back, but it was still a lot better looking than any other Facebook game I’ve seen. Project: Theralon truly is one to watch for the MMORPG community and I for one can’t wait to see more of it.